The World Trade Center Transportation Hub, designed by Spanish architect Santiago Calatrava, is scheduled to partially open next week in Lower Manhattan, more than a decade after work began. The Port Authority of New York and New Jersey, which operates the terminal, has not announced a specific date, saying only that the building will open to the public the first week in March. The terminal consists of an elliptical winged pavilion, referred to as the Oculus, which serves as the main concourse. Below ground, an extensive network of pathways link to rail and subway lines. There is no grand opening ceremony planned for the building, which sits on the eastern edge of the 16-acre (6.5 hectare) World Trade Center site. While exterior work on the Oculus is complete, the interior is not yet finished, so only a portion of the transit hall will open to the public. Full completion is slated for later this year, according to the Port Authority. The transit agency's executive director, Patrick Foye, who inherited the project from a predecessor, has criticised the terminal, calling it a "symbol of excess". "I have been troubled with the huge cost of the hub at a time of limited resources for infrastructure," Foye recently told Politico. Since Calatrava's design was first unveiled in 2004, the project's cost has soared to $3.9 billion (£2.5 billion) – nearly double the original estimate. Calatrava has said the building will be a catalyst for development in Lower Manhattan, "in the same way that the Grand Central Station and Penn Station were previously". Intended to evoke a bird in flight, the building has a skeletal appearance, with white walls that resemble ribs. The original scheme called for an operable roof, so that the pavilion's two "wings" could move up and down, but the kinetic aspect was eliminated due to costs. Inside the Oculus, an operable skylight stretches 330 feet (100 metres) along the curved roof. The skylight will be opened on temperate days, but will open on 11 September each year. The sides of the building are glazed. Intended to serve as a piazza, the oval-shaped hall is paved with white marble flooring and is ringed by two levels of retail space. The western and eastern sides feature viewing platforms and tube-shaped glass elevators. 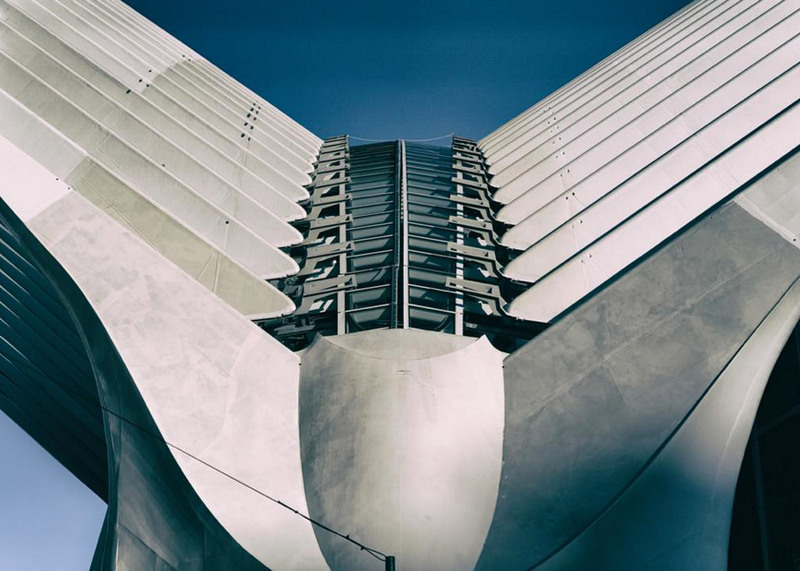 "Due to its structure and luminosity, the Oculus is a piazza for New York, the same way piazzas were traditionally understood in Europe: as a place for visiting and gathering, in which the access to the main locations of the city are articulated," said Calatrava in a statement. The retail shells are still under construction and are expected to open by August. More than 100 tenants have reportedly leased units within the terminal, including Apple, Michael Kors and Kate Spade. The terminal has drawn mixed reviews from local journalists. Justin Davidson, architecture critic for New York magazine, wrote favourably of the building, describing it as "an extravagantly idealistic creation unlike any in New York". "It challenges the city's public architecture to rise above habitual cut corners and rectilinear repetition," he said, adding that "the cost of beauty is often high". David Dunlap, a New York Times reporter, similarly praised the transit hub in a story published this week. "It is breathtaking from the inside – luminous, intricate, uplifting and tranquil. Photos of it resemble idealised architectural renderings," he wrote. "Its balconies, cantilevered like diving boards at either end of the elliptical hall, will become Selfie Central," he added. But Steve Cuozzo, a real estate columnist for the New York Post, bashed the building in a recent review. "The Oculus, which will partially open to the public the first week in March, is as functionally vapid inside as it is outside," he said. "It's a void in search of a purpose other than to connect a bunch of subway and pedestrian corridors and concourses with one another." The transit terminal is designed to accommodate more than 50,000 daily riders on the Port Authority Trans-Hudson (PATH), an underground rail line that connects New York and New Jersey. It also contains stations for four city subway lines. The building replaces the original PATH rail system that was destroyed on 11 September 2001.